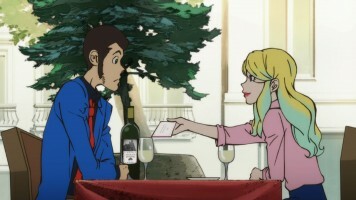 Rebecca invites Lupin to an exclusive wine auction, so he agrees to go with her as her date. 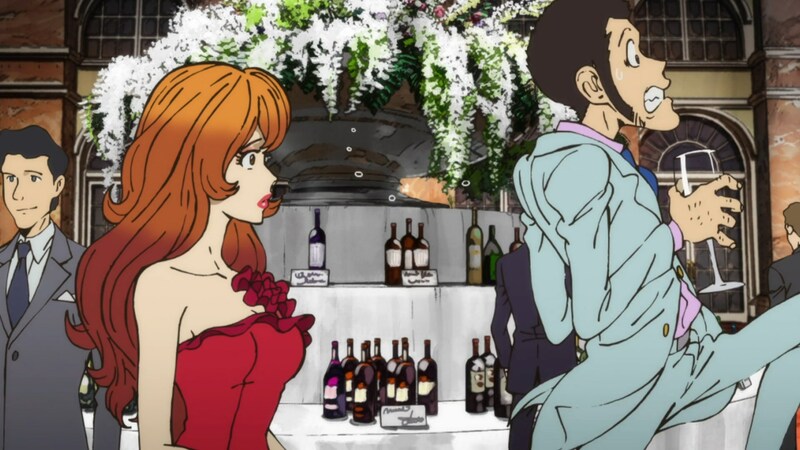 Later, Fujiko invites Lupin to the same event. 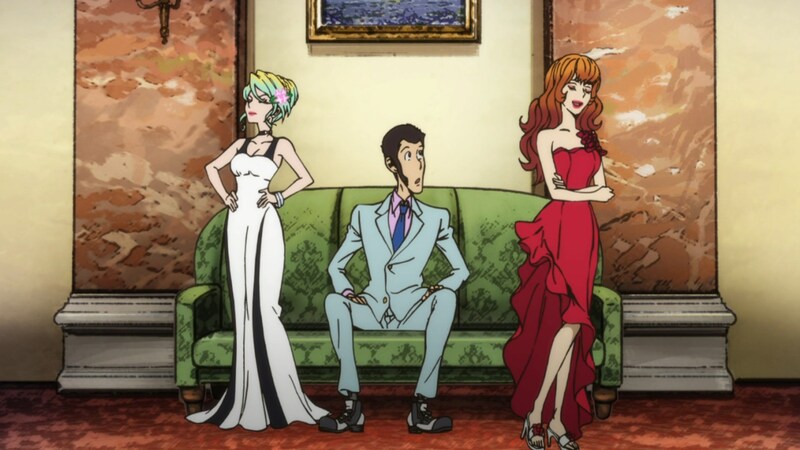 To Jigen’s chagrin, Lupin is going to go with both girls while keeping the girls in the dark. As he flits between both girls, he learns that both are after a barrel of wine known as The Lovesick Pig, a very rare wine that causes people to fall in love. Lupin thinks this means Fujiko wants him, but she only wants to steal it, then sell it for a fortune. Lupin inquires of Rebecca as to why she wants it, and is disappointed that she just wants to steal it for the thrill of it. 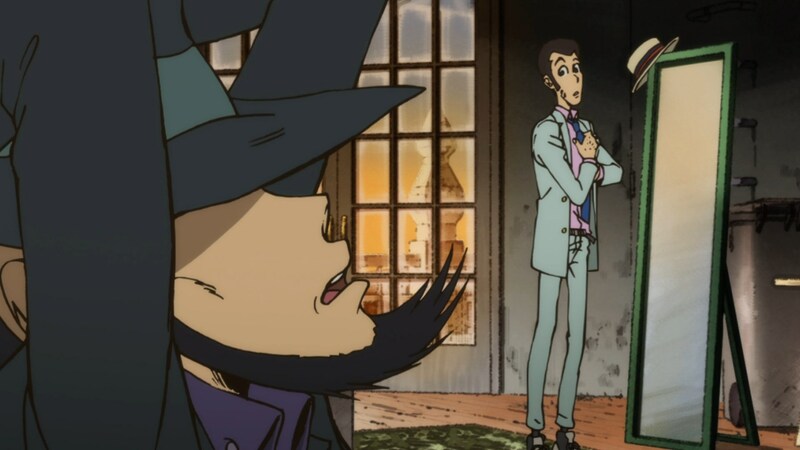 Both girls then confront Lupin, being well aware of his antics. 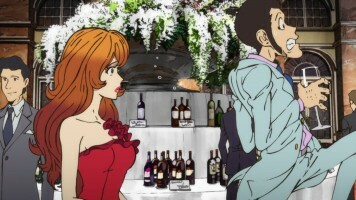 Fujiko and Rebecca lay out a challenge to each other over who can get to the wine first, leaving Lupin alone and surprised. Fujiko snags a waiter and uses her feminine wiles to get his keycard to gain access to the wine cellar. As Fujiko attempts to crack the secured vault, Rebecca changes into casual clothing and decides to just buy this mansion. With that, she gains access to the combination and opens the vault for Fujiko. 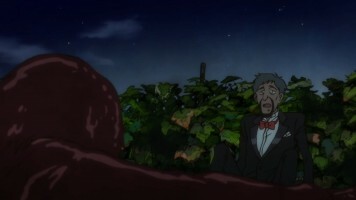 With the guest all getting romantic, Lupin discovers that all of the wine being served is The Lovesick Pig. 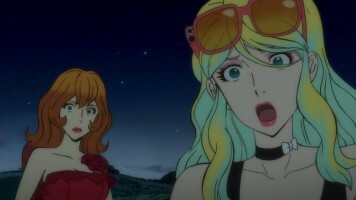 Fujiko and Rebecca abandon their quest and both become amorous for Lupin. An older, male guest makes off with the barrel, so the girls go after him to please Lupin. The girls stop him, then get into a debate over Lupin and love. Lupin arrives, having figured out the man is Guido Cesario, the creator of the wine, who’s missing wife had concocted the love potion in the wine. 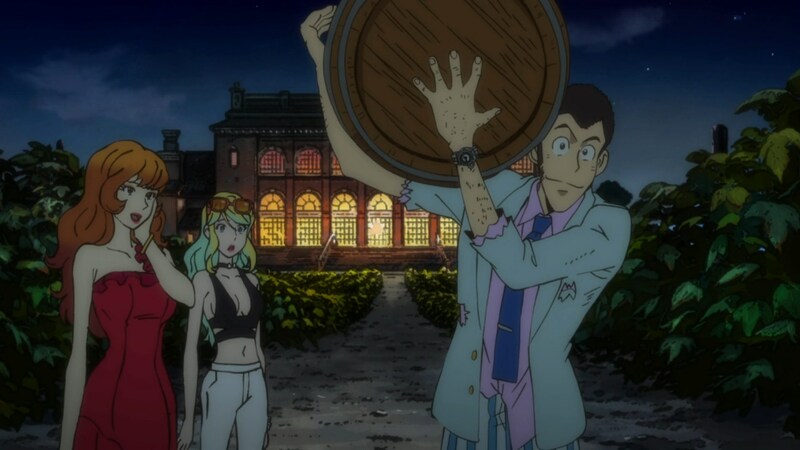 Lupin speculates that the wife disappeared because she didn’t want to do this any more, and that Guido had one purpose in getting this one wine casket back. Rebecca breaks open the barrel and the body of Guido’s wife is inside. Mystery solved, the girls suggest a ménage à trois. An excited Lupin agrees, but the love potion has worn off and they kick him in the rear instead. I think the first time I ever saw a show where a guy took two girls on a date to the same location was an episode of My Three Sons (in syndication at the time) when I was a kid. (I looked it up — the episode is Robbie’s Double Life.) 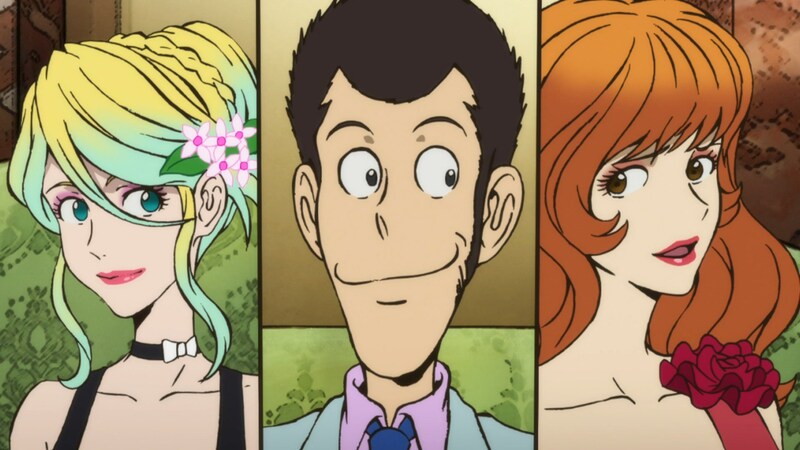 So when I saw Rebecca and Fujiko asking Lupin to the same event as their date, I immediately thought back to my childhood and my dislike of what I call cringe comedy. And yet strangely enough, I wanted to see how things would go between Rebecca and Fujiko. Let the romantic comedy hijinks begin. The first part of the episode went pretty much by the books with Lupin racing back and forth between the girls, coming up with excuses to leave. I was expecting cringe stuff, but strangely enough, I never got a cringe feeling. I was pretty funny having Lupin’s expectations shot down when he discovered neither girl was trying to get this love potion wine in order to improve their relationship with him. 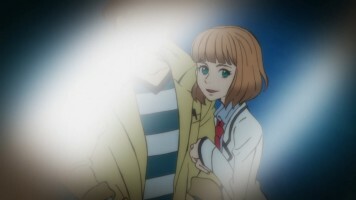 And then, Lupin gets busted, but again, I never got a cringe feeling. 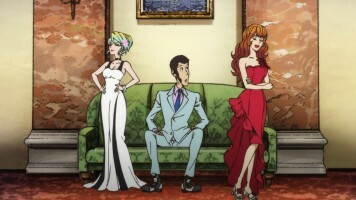 If anything, I was amused that both girls seemed less irritated at Lupin and more interested in showing each other up. That’s where the bulk of the humor comes into play. 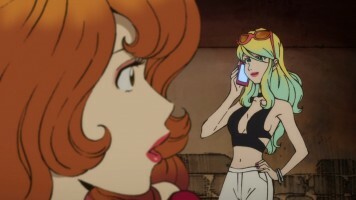 Fujiko and Rebecca going into rival mode was quite amusing. In part is was because of Lupin (Rebecca being his legal wife; Fujiko being his long time on again, off again lover), but part of it was because Rebecca is younger and wants to prove herself every much a thief as Fujiko. I got a real kick out of Rebecca’s ultimate solution to getting the the wine before Fujiko. She took a page right out of Nagi Sanzenin’s playbook (Hayate the Combat Butler) by using her wealth to just buy up the mansion where the auction was being held, and that just made me laugh out loud. At the same time, this rivalry between Fujiko and Rebecca made me realize that even though Fujiko has Lupin’s heart, in reality, Rebecca is the one closer to Lupin’s kind of girl. 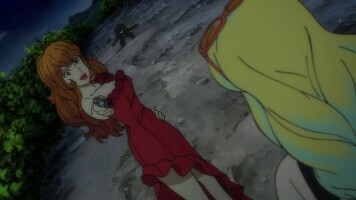 Fujiko only steals for money. For Lupin, it is the challenge more than anything, which is Rebecca’s motivation for being a thief. 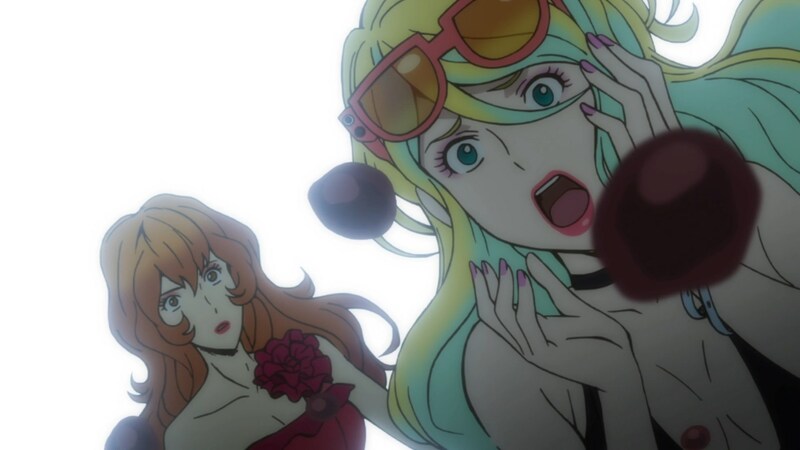 And yet here, it is clear that Rebecca doesn’t love Lupin (she does like him), yet the episode seems to imply that Fujiko might actually love Lupin. While this entire episode was nearly done for comedy purposes, there was a really dark moment when it is revealed that Guido Cesario had killed his wife, stuffed her in a wine barrel, but then apparently the barrel got purchased by accident and it has taken him all this time to try to get it back. The anime has been very careful about not being gory or otherwise gross, so they tactfully handle her body emerging from the barrel by just showing its form as the contents spilled out without going into detail. I appreciated that. Still, this was a rather dark moment for what was an otherwise fairly funny episode. Finally, we get another reference to the Dream of Italy and Rebecca’s apparent connection to it. I’m interested to see how that plays out. In the end, this is another really good and funny episode featuring Lupin’s missus and ex.